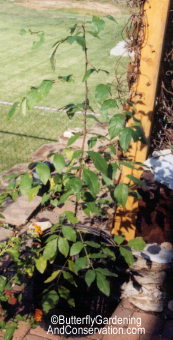 Prickly Ash growing in a pot. Prickly Ash, also known as a 'tooth-ache tree', is a shrub with many branches. It is a member of the Citrus family and has small spines or thorns along its branches. 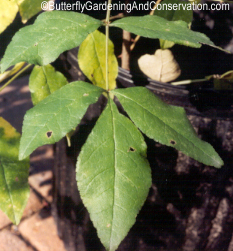 It is native to the US and can be found in many places in the east and midwest. There are about 12 native species of the Citrus Family (Rutaceae) in N. America. Most members of the family are shrubs and trees and rarely herbs. Rue (Ruta graveolens) is one example of a Citrus family herb. Close-up of Prickly Ash leaves.